Imagine an iPad Air sliced in half. The top half peels up to reveal a pin-sharp high-res screen. The other half has a full-size keyboard that’s almost flat. This is the new MacBook. As usual, Apple’s latest crazy-thin laptop is dividing the tech punditsphere. Because it comes with only one port, some think this machine is too radical, too new. It’s been called a glorified netbook — short on features, and, to really rub it in, high on price. But I’m smitten. We have one in here at the Cult of Mac offices, and I’ve been putting it through its paces. Here’s what I found. It’s a beauty and you should buy one. 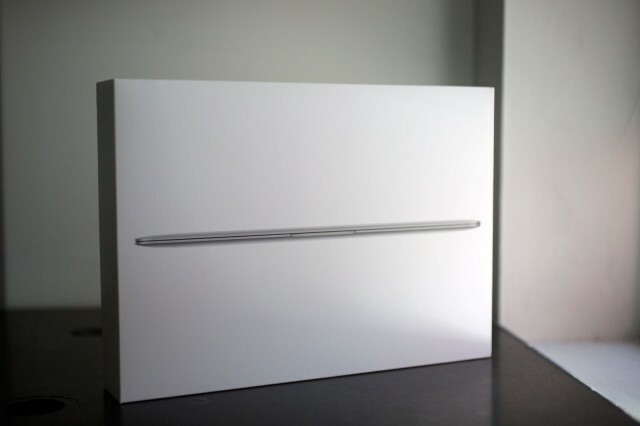 The new MacBook is Apple’s thinnest and lightest laptop yet. It’s no exaggeration to compare it to the iPad Air, which is near-anorexic itself. I never use the USB slots. With the rise of the cloud, the world has gone wireless. We don’t need wires or slots any more. Photos, music, video and software are all streamed from online. If you want to share something; that’s wireless too. If I share anything from my computer, it’s via Dropbox, AirDrop or AirPlay. And I could give a hoot about the processor speed. It’s not relevant to what I do. I surf the web, read and write email, and open a thousand tabs in Safari and Chrome. I don’t edit pictures and I don’t do much video. Processor speed has minimal impact on what I do, but the amount of RAM does. More RAM = more tabs. The new MacBook is almost as radical as the first MacBook Air, which caused a shitstorm because it didn’t have a CD/DVD drive. At the time, no optical was seen as madness. It’s always the same with every new Apple machine that ditches legacy technology. This one ditches a few, but it gets some great new ones too. It’s a handsome machine. It’s both angular (at the edges) and rounded (on the lid and the base). There are no ugly ports, doors and flaps to ruin the look. The shiny chrome Apple logo looks subtle and great. It’s got drool-appeal in spades. Silver, Gold or Space Gray? What color should you get: Gold, Silver or Space Gray? Silver is classic and always looks good. The gold is classy and not gaudy, but it’s outside my comfort zone for a laptop. My pick is Space Gray, which is handsome and stealth. It’s been a long time since Apple offered a laptop in a dark color, and it’s a great return to form. The case is metal, but the bead-blasted surface isn’t cold and metallic. The anodized aluminum is soft and pleasing to touch. 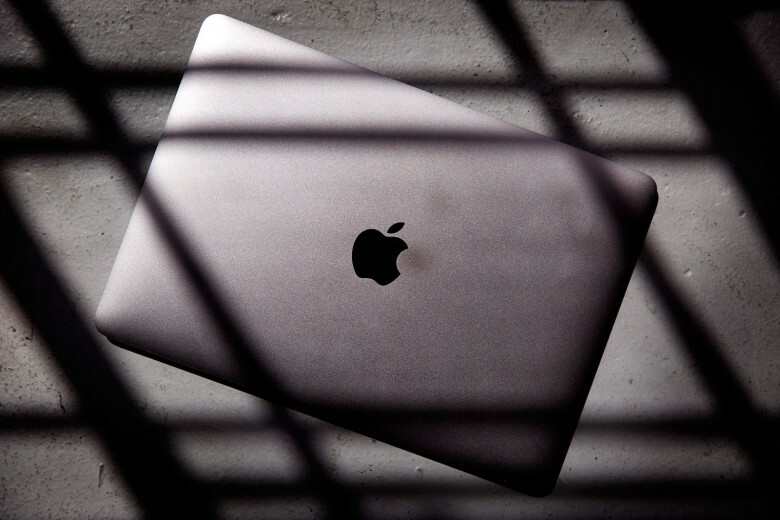 The machine is about three-quarters of the size of the existing 13-inch MacBook Air, and it weighs just two pounds — about a pound lighter than the Air, which is already light and airy at 2.96 lb. It’s pretty gossamer. It’s so light, I actually have trouble balancing it on my lap. It skitters about. The build quality is superb, of course. The tolerances are tight. I can’t actually see the seam around the trackpad. Despite its lack of heft, it’s still possible to open the lid with one hand. 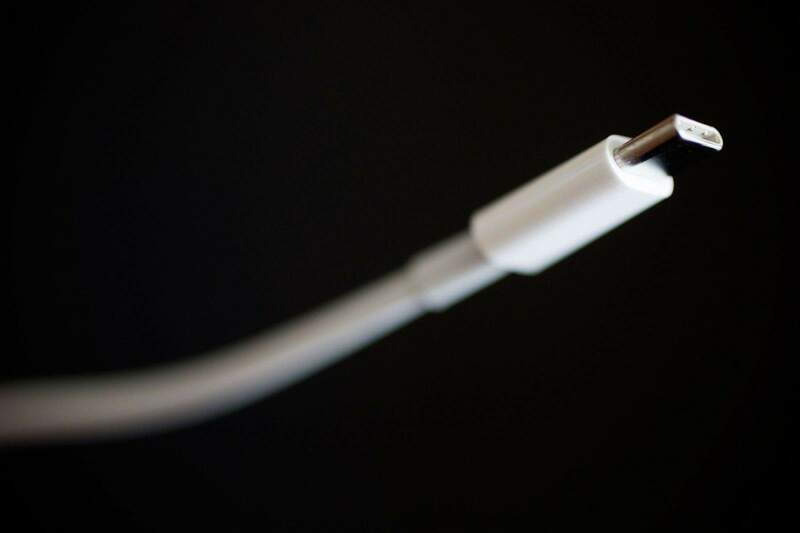 It’s a feat of hidden engineering that’s a source of quiet pride to Jony Ive and his team. The hinge mechanism has a special clutch that lifts the lid without bringing the base up with it. It’s beautiful and subtle and one of the reasons you pay a premium for Apple’s devices. But to my mind, so worth it. Of all the changes, the keyboard is the most controversial. The haters are hating on the keyboard. It’s a dealbreaker for some. 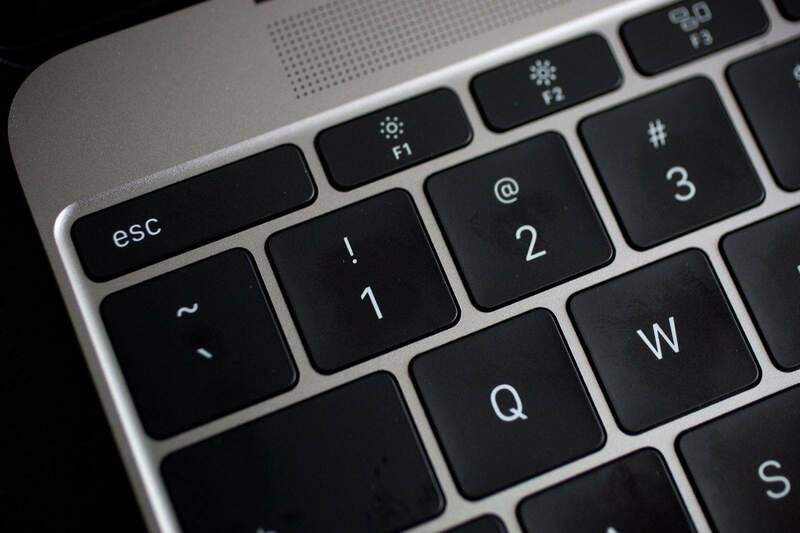 To make it so thin, Apple redesigned the keyboard with near-flat keys and a new mechanism. Apple swapped out its old “Chiclet” style keyboard. Instead of a “scissor” mechanism, which is kinda wobbly, the new keyboard has a “butterfly” design that eliminates all movement except straight up and down. Like Apple says, it’s stable and precise. This leads to better typing, Apple says, because keystrokes register no matter where your fingers strike. How does the keyboard feel? Not bad. It definitely takes some getting used to. At first, it’s like typing on glass — but glass that unexpectedly clicks. There’s almost no travel, just a firm click with each keystroke. The clicking is a little strange. I’m still getting used to it. Long-term I’m sure it’ll be fine, and maybe even pleasant. I already like the tight precision of it. My coworker, however, hates it. The sound and feel reminds him of people cracking their knuckles. It makes his skin crawl. The keyboard is backlit, and because each key is lit by its own LED, there’s very little light leak. It’s very neat and precise. The trackpad has also been redesigned and renamed. 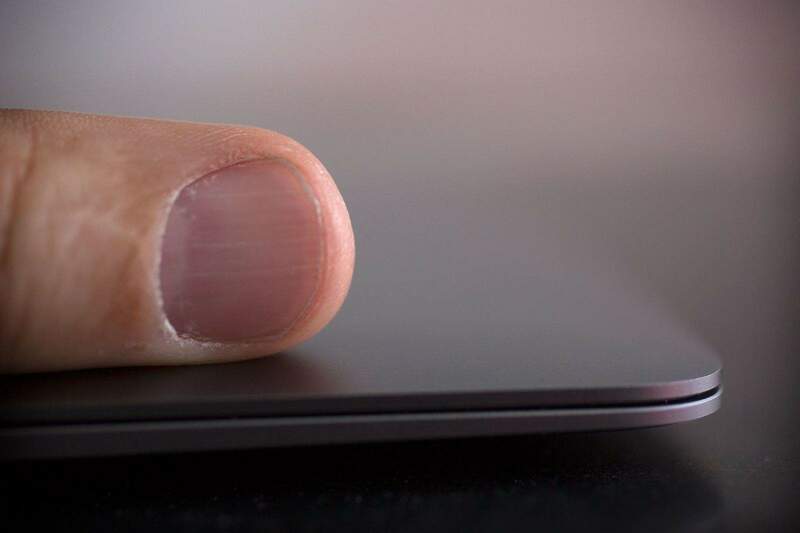 It’s now the Force Touch trackpad, and it has no moving parts — it’s all digital. And it’s deeply weird. The trackpad features sensors that detect how much pressure is being applied, and feedback via the Taptic Engine taken from the Apple Watch. Even though it doesn’t move, the Taptic Engine makes it feel like it does. Press on it, and it feels like a click. Press on it harder, which enables new pressure-based gestures, and it feels like a deeper, double click. But the trackpad is not moving at all; it’s the Taptic Engine tapping your finger to give the illusion of movement. You feel it even when aware of what’s happening, and you can’t unfeel it. It’s a bit uncanny and weird. The Force Touch trackpad enables a new gestures called “Force click” that is invoked by clicking and then pushing. It takes some getting used to, but quickly becomes intuitive. Thanks to Taptic feedback, it feels like a double click where the second click goes slightly deeper. Again, the feeling is illusory. So far, I’ve used it mostly as a replacement for right click, although it does more. In email, Force clicking is pretty great for checking links without opening a browser window. Just Force click the link and an overlay pops up with the page. Same with tracking packages. I also found it useful for previewing files. Force clicking on a file’s icon in the Finder, and it pops up a Quick Look preview. It’s pretty handy, and a step easier than the old way of selecting the icon and pressing the Space bar. Force click can be used in the Dock, Safari, Maps, Photos and bunch of other apps. Apple promises more, and has opened up the API to developers. As for haptic feedback, there isn’t a lot yet, but I played with one in the new Photo app. When rotating a photo, it gives a little click at zero degrees. To be honest, it wasn’t that compelling, but I can see how this kind of feedback would be helpful when aligning text of photos in a word processing app, for example. You get a click when someting is properly aligned. When it rolls out more widely, it’s going very handy and be a big time saver. 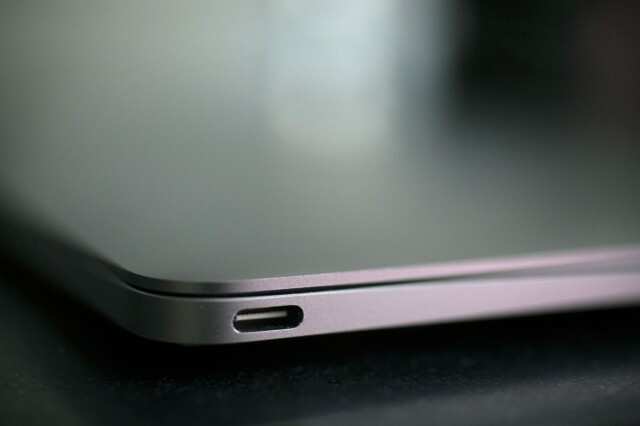 The brand new USB-C power plug looks a lot like the iPhone/iPad’s Lightning connector. It’s small and compact and reversible. It pops with a nice click. On the plus side, the cord and brick are a lot smaller and easier to carry than previous power adapters. On the negative, it sticks like glue to the machine. For all my forward-thinking enthusiasm for this MacBook, I’ll miss the old Magsafe power adapter, which attaches via magnets. My blundering kids are always tripping on wires, and I can see the MacBook taking a violent trip across the living room. It’s the first time Apple has used a non-proprietary power adapter. Apple hasn’t explained why, but the company seems to be developing USB-C as a standard, which might help it with Euro-zone laws demanding electronics companies use standard charging devices. The USB-C power connector has several different functions. As well as power, it provides USB 3.1 connectivity and three different video outputs: DisplayPort, HDMI and VGA. Apple offers a couple of USB-C dongles for connecting HDMI or VGI displays, which also function as standard USB adapters. At $79 each they’re expensive, of course. A USB-C to USB adapter is available for $19. I know the prospect of buying yet more dongles fills some people with rage. I have a drawer-full myself. But I’ve never bought a dongle or adapter for my iPad and iPhone — everything’s wireless — and I’m pretty sure it’ll be the same for the MacBook. It’s wireless all the way. The 12-inch Retina display is gorgeous. It is razor sharp and vibrant. It’s immediately obvious it’s a Retina display, which means individual pixels can’t be distinguished at normal viewing distances. Heck, I can’t distinguish them squinting up close. The screen has a resolution of 2304 x 1440 and a 16:10 aspect ratio. The screen and lid are extremely thin. Apple calls it “paper thin,” which isn’t too much of an exaggeration. The glass measures just 0.5 millimeters and the entire lid is just 0.88mm thick. While it’s thin, its rigid. It doesn’t flex. In fact, the whole machine is pretty sturdy and inflexible. Because there’s no room, the MacBook ditches the beloved glowing Apple logo. 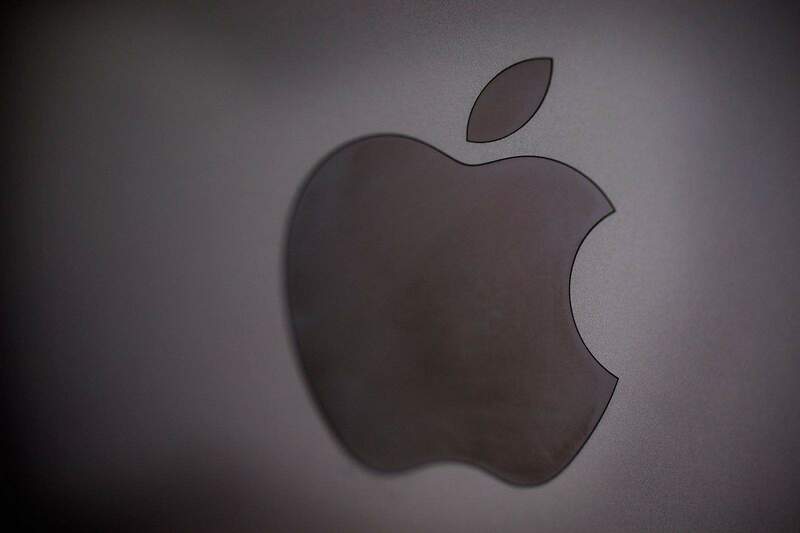 Instead, there’s an shiny inlaid Apple logo like the logo on the iPhone and iPad. I like it. It’s classy. One of the things I didn’t realize is how easy it has become to set up a new machine. Unlike days of old, when you backed up and copied files from one machine to another or to external drives, it’s all done with a few clicks now. A lot of stuff is brought over via iCloud, including all your internet accounts — email, Twitter, Facebook, and LinkedIn. It’s a huge relief not to have input these setting one app at a time. If you’re using Apple’s iCloud services like iCloud Photo Library and iTunes Match, your photos and music are brought over too. There’s still the tedious chore of downloading apps (starting with Dropbox and 1Password), but if they were downloaded from the Mac App store, it’s dead easy to reinstall your list of “purchased” apps. What used to take several hours is now a 30-minute job. The MacBook is the first Apple notebook without a fan, thanks to Intel’s low-power Core M processors and integrated HD 5300 graphics. The logic board is impressively small. It’s closer to an iPad logic board than a laptop’s. 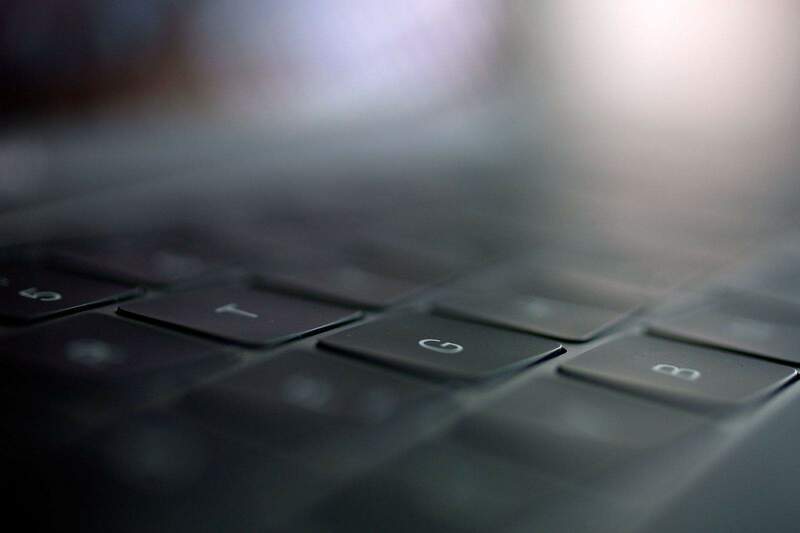 The new MacBook comes in two configurations, each with 5th-generation Intel Broadwell processors, which are optimized for battery life over processing power. The $1,299 model has a 1.1GHz dual-core Intel Core M chip. The $1,599 model has a slightly faster 1.2GHz dual-core Intel Core M.
The chips feature Intel’s Turbo Boost technology, which can bump speeds to 2.4 GHz and 2.6GHz, respectively. Turbo Boost is like overclocking on demand. When activated, the chip jumps to its highest performance state. Performance wise, benchmarks show the 1.1GHz machine is on par with the MacBook Air from 2011 — a big step backwards. The 1.2GHz machine fares better, with CPU performance comparable to the 2014 MacBook Air (albeit the low-end models). There’s a build-to-order 1.3GHz machine, but it’s not shipping yet and the benchmarks aren’t yet available. However, the benchmarks do not measure graphics performance, which should be a greatly improved from a 2011 machine, thanks to the Intel HD 5300 graphics. I opted for the entry-level CPU, and so far everything’s been fine. Critics say they are weak processors designed for tablets as much as PCs and won’t be powerful enough to handle most normal users’ needs. However, I found that Web pages render instantly and hundreds of email messages load quickly. I’ve seen the spinning beachball only once, when I first opened the new Photos app in Yosemite. It was mostly, I think, because it was loading a huge photo library in the background. It’s not the zippiest CPU, but day-to-day, I’m pretty sure it’ll be fine. Most of the case is taken up with big battery packs. The batteries — there’s several — are terraced to efficiently fill the maximum amount of space inside. Apple calls it an “all-day” battery and estimates up to nine hours of web browsing or up to 10 hours of iTunes movie playback. Some early reviewers got less than this — about seven hours — but I got 11 hours of general use, which is above Apple’s estimate. True, it wasn’t doing anything taxing like playing HD videos or generating Mandelbrot sets. I was writing, surfing and emailing. But I didn;t dim the screen or any battery-saving tricks like that. I think it’s pretty great. I hate lugging around a charger. I’m confident the MAcBook can be taken out all day — and I mean all day, from dusk to dawn, without the need for a charger. The MacBook comes with 8GB of RAM, which isn’t huge but it’s adequate. My old MacBook Air had 4GB and it would occasionally choke if I was on a particularly egregious browser tab binge. Apple’s always been stingy with RAM, and there’s no RAM upgrade available when ordering or after market; it’s soldered on. 8GB is all you get, and for that you’ll be thankful. Storage is solid-state and speedy. The MacBook boots up in a flash and apps open instantly. You can choose between 256GB or 512GB. Wi-Fi is 802.11ac (also very fast) and there’s the latest Bluetooth 4.0. The FaceTime camera is only 480p, which is lower resolution than the MacBook Air and Pro, but who cares? I rarely use it anyway. It has stereo speakers and dual microphones. The speakers on Apple’s laptops have never been a strong point, but these speakers are surprisingly good. Shocker: the MacBook is in short supply. When I went to the Apple Store last week to try on some Apple Watches, there was almost as big a crowd around the new MacBooks. They are on display, but alas, not in stock. One can not simply walk into an Apple Store and pick up a new MacBook. It’s available only online and most models are taking weeks to ship. It’s easiest to get a pre-configured Silver MacBook. Both models are shipping in one to three days, according to the online store. The Gold and Space Gray models are taking three to four weeks, as are custom orders with the 1.3GHz processor upgrade. The tech industry tends to equate value with features. More features equals more value. 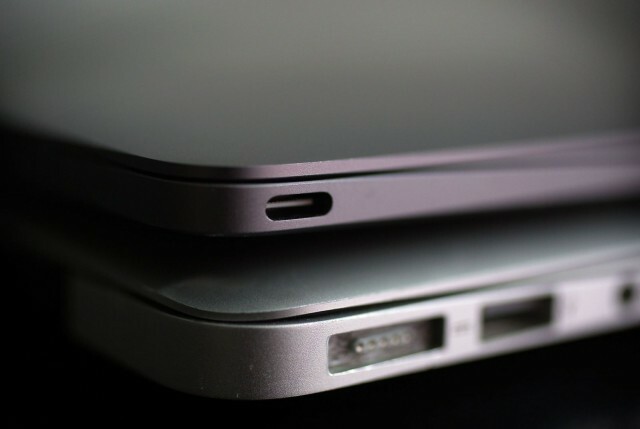 So when Apple takes away things like USB slots, it’s seen as delivering less value. But taking away is Apple’s way of moving on, and that’s why the machines that make the biggest technological leaps are the most exciting. The fact that Apple named this machine simply “the MacBook,” rather than adding a suffix, like the Air or the Nano, suggests this is the future of its laptops. It almost certainly is. The world is wireless and the new digital hub is the cloud. The iPhone and iPad are pure wireless. They don’t have USB ports and have no need for them. The laptop is finally catching up.